With the perfection of the planar process, the pace of IC development picked up rapidly. Almost every year brought important, often unexpected, advances, and there was no way to predict where the next breakthrough might originate, or with whom. Such was the case with the metal-oxide-semiconductor field-effect transistor, or MOSFET, invented almost out of the blue by Steven R. Hofstein and Frederic P. Heiman, two young engineers at RCA's research laboratory in Princeton, New Jersey. 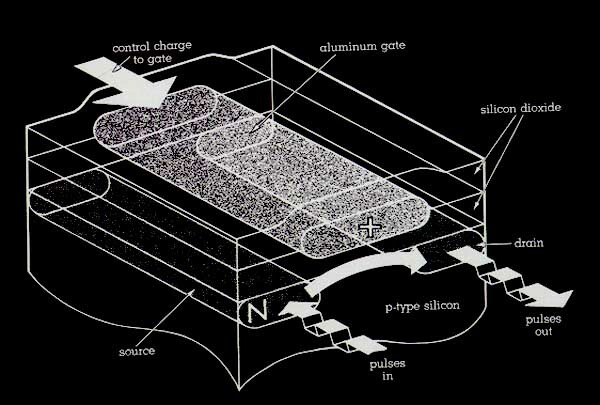 Until the advent of the MOSFET, ICs used only the bipolar, or junction, transistor, which had been created by William Shockley at Bell Labs in 1950 (pp. viii-ix). In general, bipolar transistors serve as ultrafast switches, whose inherent amplifying properties make them easy to turn on or off. Bipolar transistors are essentially sandwiches of doped silicon and come in two distinctive varieties: electron-doped, or npn transistors (negative-positive-negative sandwiches); and hole-doped, or pnp (positive-negative-positive) transistors. Although a MOSFET is slower than a bipolar transistor, it is cheaper, smaller, and less power-hungry. However, both forms of transistor have their own applications; for example, microprocessors are invariably composed of MOSFETs, memories of MOSFETs or bipolar transistors. MOSFETs can also be made in electron-doped and hole-doped models - the former called n-MOS, the latter p-MOS - but because holes convey current about three times more slowly than electrons, hole-doped MOS transistors have become obsolete. Metal-Oxide-Semiconductor Field-Effect Transistor. A MOSFET is a solid-state switch that is turned on by electrical pulses applied to an aluminum gate. The example above is an n-MOS version of the MOSFET. A positive charge sent to the gate repels positive ions from the channel between the source and the drain and attracts electrons to that channel. When the channel is saturated with electrons, electrons in the source can travel across the positively charge silicon to the drain and from there out of the device. Suitably modified MOSFETS can be made into capacitors.